Your primary focus in working in an optometric practice is delivering the highest quality of care to your patients. However, your practice is also a business, which means it relies on collecting payment from insurance claims, patients purchasing frames from your optical dispensary, and sometimes from a patient after the exam. Unfortunately, collecting payment from patients can be difficult, and if done incorrectly could result in negative reviews and a strained relationship. So, how do you collect on unpaid patient balances to ensure you can continue to provide quality eye care to your community? Below are three strategies for dealing with unpaid patient balances. Sometimes all you have to do to get a patient to pay an outstanding balance is contact them. Sending a patient an effective, personalized letter informing them that they have an outstanding balance may be enough to get them to pay. If they don’t respond to your first attempt, look into calling the patient. 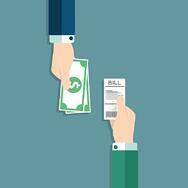 An important thing to remember here is that you should make it easy for your patient to pay their invoice. If your practice routinely has to deal with collecting payments from patient’s after they have left your optometric practice, then you may need to cut your losses and update your practice’s policy to try and collect any copay upfront and credit the remaining balance based on the EOB received after the appointment. To make the invoice less of a shock, you should pull the patient’s benefits a few days before the appointment, so you will know ahead of time when that the co-pay is and can communicate that with the patient early on. If a patient still refuses to make a payment on an outstanding balance and if you’re willing to go through some headaches, you could turn the statement over to a collections agency. Because collection agencies can be expensive, it may only make sense to enlist their help when it’s a high-value outstanding bill. Whatever you decide to do, consult with an attorney to ensure you comply with local, state, and government laws and regulations. Want more tips like these? Subscribe to the VisionWeb blog.